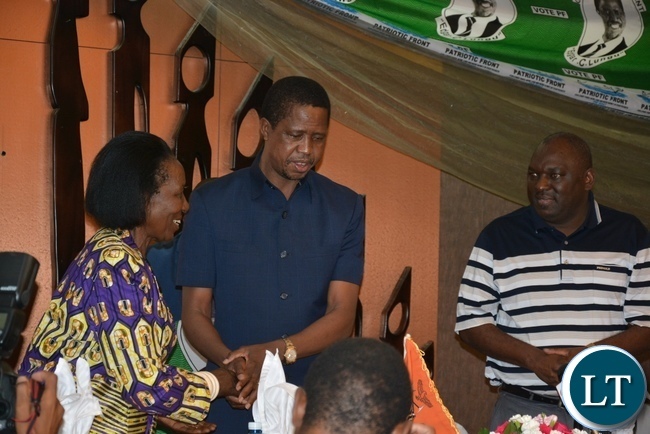 PRESIDENT Lungu is today expected in North-Western Province for a two-day working visit. According to a programme released to ZANIS by the provincial permanent secretary, Ephraim Mateyo, President Lungu is expected to visit Solwezi and Mwinilunga districts. “In Solwezi, President Lungu is expected to attend a church service at the New Apostolic Church in Kyawama. In the afternoon, he will hold meetings with the council of elders, chiefs and party officials at Kansanshi Hotel,” Mr Mateyo said. Mr Mateyo said President Lungu will in the evening officiate at a fundraising dinner organised by the United Church of Zambia at Kansanshi Hotel. On Monday, the President will be in Mwinilunga for a ground-breaking ceremony of the Manyinga-Jimbe road construction works. “While in Mwinilunga, the President will also inspect the connecting of the North-Western Province to the national grid before proceeding to the Kyawama livestock breeding centre. President Lungu will end his tour on Monday after commissioning the solar at Kambanzhi in Solwezi,” he said. And Vice President Inonge Wina is today expected in Northern Province where she will tour some developmental projects. Northern Province Permanent Secretary Hlobotha Nkunika who confirmed Mrs Wina’s visit to the Province said the vice president will be in Chilubi and Luwingu districts. Mr Nkunika said while in Luwingu the Vice President will officially hand over Menga Health Post which is part of the 650 health posts government is constructing countrywide. He said in Chilubi, Mrs Wina is expected to tour Kambashi Fish Farm which a Catholic Church-run project involving women in fish farming. More to you and your administration. You win, Zambians win. Stay the course with momentum with animateD foot soldiers. Under the Chagwa Presidency, it’s no true Zambia left behind. Blessed is this selfless President with a meek spirit. Mr President, why not check also the progress of the Chingola – Solwezi road? What PF seem to miss like now is that people have seen the so called “massive development” so many times in the last few yrs on ZNBC & ZANIS news, that it doesn’t excite anybody, anymore as achievement. Remember KK was voted out after building UNZA, UTH, Gt North & East Rd’s etc. Just work on cost of living to get votes, otherwise it’s like buying Plasma TV at home when there is no m.meal. No one will be impressed…!!! True mate. We Zambians and africa as a whole we should know that roads building in itself is development but we should also remember that it is Govt responsibility to build roads, etc so in the first time it is developmeny only if there was no road before. But living standards improvement is the best development world wide. It is like wearing beautiful cloths but you are hungry witgout food on the table. No matter how good you can look without food you are nothing. So let us develop our health and food then the whole world will know us and they will come to buy and admire us. Take a good example of Cuba. This time place lacks development but health wise not even america can beat them. Food wise they are good also. This tiny** place lacks development but health wise not even america can beat them. Food wise they are good also. Yes constructing 650 health posts all in the bush where NO ONE CAN SEE THEM!! Clever Donchi Kubeba!! Campaigning whjen restricting others, that sounds like unfair way of doing things. What are you scared of? Let the opposition also freely campaign, this is a democratic country and not one under a dictator like Mugabe. @1.3, MR LUNGU HAS GOT A PLANNED PROGRAM. HE IS NOT VISITING THESE PLACES AT RANDOM. IF WHERE YOU WISH HIM TO GO IS IN HIS PROGRAM, HE WILL. BUT, OBVIOUSLY DURING CAMPAIGN TIMEME HE WILL BE TOUCHING ALL PLACES INCLUDING THOSE NOT OF YOUR PERSONAL INTEREST. BUT, IF YOU ARE SO DESPERATE YOU CAN ASK YOUR TRIBAL HH TO GO THERE FOR SHOPPING. 50 years after independence and we get excited when a road is constructed and at great cost through loans or RDA flawed tender process….what a shame…a road like health care is a basic right…this is why you pay tax. You mention this lazy bum Edgar commisioning a solar plant…how many M-watts and what cost, they had to wait until it was too late and start panic buying solar products. Lungu and his PF are panicking. People are already fade up with their fake messages and are waiting patiently to hear HH s message in May. What ever they are doing is not going to save their asses because know that PF is a poor finisher and full of thieves. HH is making these guys to panic. The PS for NP is Nkunika. He is enjoying his stay there no tribalism what so ever. But ask a bemba who is working in SP. you will hear of very sad stories. The govt should speedly complete infrustructural development in term one. Come second term The boat will carry the team that will come to fix human development. HE may I propose Luo or kaseba to be your running mate sir. 650, they have only finished 34 according to Kambwili yesterday. Violent & selfish leaders in panic mode. Even if you try to frustrate the opposition, Pf is no longer popular to win this year’s election. .
Why campaign heavily when you’re the incumbent?. It is said ‘Action Speaks Louder than Words’, therefore when you’re a sitting president and seeking another five year mandate your economic, social, legal, political, technological and other performance criteria of your country during your term should be sufficient enough for voters to make informed and intelligent choices. It appears the top PF political leadership has gone into panic mode and moving all over claiming to inspect developmental projects when they’re actually campaigning. The head of state should give hope and answers to how he intends to reverse the economic turmoil which has engulfed the nation and other negative political and governance trends. In America, that doesn’t work in African democracy!! @4, THEY ARE NOT CAMPAIGNING. THEY ARE INSPECTING PF GOVT PROJECTS AND MEETING ALL AFFECTED PEOPLE TO HAVE IDEAS ABOUT THEIR NEXT DEVELOPMENT PROJECTS THEY WISH FOR AFTER THOSE THE GOVT IS ALREADY IMPLEMENTING IN EVERY CORNER OF ZAMBIA. GO LUNGU GO, GO INONGE GO, GO PF GO. VIVA ALL ZAMBIANS. Like it happened in January 2015 where HH was miles ahead but ECL beat him. Last kicks of the dying horse. While you are cheated pipo love you, the silent influence of others will reign supreme. You have been the waste president in the history of Zambia. Lets try another Dinosaur, possibly of the HH type or Miles Sampa. Thanks! Whether you talk good or bad truth be told this Presido will go down in history as the most unsuccessful..if in class would be categorized as umukopo. Come August 2016…you are to go. The PF’ strategy is a political miscalculated one,they think that people are happy with all these manoeuvres while suppressing the opposition.People need new hope & assurances more especially from HH & his team.PF is just cheating itself,people are despondent with it,anyway,let it finish all its lies before its start saying ME TOO from HH & his team!This just makes UPND & Zambians more anxious for regime change,imagine another 5years of mediocre rule with poverty,violence,unemployment,corruption,nepotism & mismanagement as well as kaloba after kaloba!Only ghosts will vote for PF!Its so surprising that these devils in PF are not seeing it not normal to campaign alone! let him come, we will harras him such that he will never come here again. look at chingola – solwezi road malabishi. how can he keep on commissioning more roads even before he finishes the first ones? if we harras you its not upnd cadres but zambian cadres who feel neglected. the other day we saw a road collapse in mpulungu like a bridge that was due to shoddy works at our expense and you allow that. Ba zed just be on look out for PinFiltrators who might try to create an impression that you are violent, like what happened in bweengwa, just bid farewell to him doing a bye bye sign, he already knows what time it is, and no one will miss him. The winning of mseveni after so much publicity of the opposition by the media speaks volumes of what may happen after 11th august. its possible that the man labeled vision-less when he is abroad marketing Zambia or lazy when he visits the developmental projects taking place in Zambia will win with a very large margin. Look at the huge margin of mseveni, i would like to believe that he rigged like many say but with 5million to 2million, we might think twice. If really you Zambians want change especially those in the diaspora who insult so much but know they won’t vote themselves, kindly return home, register as a voter and vote for your candidates so that they can stand a chance of winning. Otherwise its ECL. Museveni, Mugabe, Nkuruzinza, Kagame and Kabila have brutalized and raped the collective consciousness of the citizens. This will NOT happen in Zambia. North Western Rhodesian psych is such that they can neither be intimidated nor bought in the bulk unlike their Northern Bemba speaking compatriots. And tribal balancing in Zambia makes the madness obtaining in these other dictatorships untenable for long. Watch ECL minuscule votes especially from North Western province in August. Mus1eveni, Mugabe2, Nkuruzinza3, 4Kagame and Kabila5 have brutalized and raped the collective consciousness of the citizens. This will NOT happen in Zambia. North Western Rhodesian3 psych is such that they can neither be intimidated nor bought in the bulk unlike their Northern Bemba speaking compatriots. And trib1al balancing in Zambia makes the madness obtaining in these other dictatorships untenable for long. Now that you have told us that your running mate will be bo inonge wina , would you tell your pf police to let the opposition freely mingle with Zambians.hope nawakwi won’t be the next victim like nevers Mumbai for your aimlessly dangling carrot, no one will beat the old lady in her puppetry masterly, chagwa is her little puppet, she forced him to be what he is today. Comment: A beligerent president is set to kill using police during election. He said if police have failed to deal with UPND then they shld step aside. The meaning of this is of course he will deploy soldiers to demolish UPND because his cadres have failed. anyone who knows how to have planes disappear??? Pathetic. It’s in the air. Kuya batile. For a change Zambia will do the correct thing by electing HH and UPND to bring sanity to the nation. Members of opposition have 57% death rate higher than members of the ruling. lets learn to live positively if we are to live longer. The more hatred you acumulate the weaker your body cells become. The weaker your cells the more diseased you are likely to be. Stop killing yourselves by seeing bad always in PF becoz its not good for your health. The president and veep are simply doing their work we elected them for. If opposition is seeing this as campaigns it’s very unfortunate. These guys were not voted into power to be sitting in offices only but to see whether the talk is matching the implementation. You also need to check the dictionary meaning of campaign so that you avoid posting irrelevant comments. Pf doesn’t deserve any N/W P vote.. The province is messed up. . Commissioning footbridges, and some chap says that there is massive development. ,yaba! Mr H.E. or is it her Honour! Lest you forget, Mwense awaits your commissioning of a Hospital, a clinic, Trades Training school near my village and 2 secondary schools. So both the Veep and the President out of office at the same time…no wonder thee empty tins are so disorganised and in confusion…they say the lazy bum Edgar is on a working visit but all you will see is him showing the PF symbol all over the place!! @Luapula Premier-we know you to be mad,consider Chainama just like your cohorts Eddy & Katondo Boys!Mind you,some provinces have never been considered for such developmental projects despite them contributing massively towards the treasury more than your Northern provinces put together. Some Provinces only get hate speeches,violence & all sorts of unprintables as their rewards! Then stupid & dull PF leaders want these neglected provinces to vote for their drunkard leader.Anyway,only two months left for kick off time & no one will be told who is the next president! Choma is about to overtake Kabwe and Mufulira. Have you been to Livingstone lately? Harry Mwaanga Nkumbula airport? The paving that is going on in Livingstone town itself? Numerous new clinics and secondary schools dotted around SP?…..Which province has been left out? Are SAM or MASO? l have come to accept that, there are some tribes which cant appreciate no matter how good things are given to them, lm not a bemba or easterner, I have a proof coz I stay with them and you have to be strong to be with them. Out of 650…. only 34 are done……..PDF needs 50 years to complete the health posts…. Wapya 90 days…..
And it is all because of Lungu? This kind of ignorance ranting is what will cost your little god votes this year. As far as most of us are concerned Gulf economies despite the war in Syria are facing declining economies just like Zambia because of the cooling in the economic growth of China resulting in very low demand = low prices for commodities such as copper and oil. Ours is a very small economy which has been dependent on copper for forex. It is criminal and extreme naivity to blame Lungu for the economic hardships we are currently facing! As far as I’m concerned, I will vote for Lungu because he has kept the economic momentum in the face of difficulties. Go on and vote your choice, but if my candidate wins, no rumour mongering of rigging! MASO, YOU HAVE MENTIONED CHIRUNDU, KAZUNGULA, FALLS ETC BORDER POSTS. WHERE DO U THINK QUEUES OF TRUCKS SOME OF THEM STRETCHING AS ALONG AS 5KM LADEN WITH INFRASTRUCTURE DEVELOPMENT EQUIPMENT ARE GOING? COMEDIAN TREVOR NOAH OF SA JOKES ABOUT HOW ZAMBIANS BECAME SO EXCITED AT THE SIGHT OF ESCALATORS IN LUSAKA. PLEASE COME TO LIVINGSTONE’S NEW BUS RANK. DO YOU RECKON MY KITH COULD MAKE ANOTHER MISTAKE THEY MADE TO PUT THE YOUNGSTER CHILUBA IN POWER? 5 YEARS HAS BEEN TRULY REMARKABLE. IN CHIBEMBA WE SAY, “U UTASHA MWANA WA NDOSHI”. @Man M the cost of living has always been high in the world. PF did not bring the word poor, it came before PF. pipo have been suffering before PF thats why PF is introducing new districts, building schools, hospitals and roads. If you chuz not to see these things we cant force you becoz potential voters are apreciating. The cost of living is perennial, no one shall bring down the costs except the son of God. Never. The cost of a 25kg of mealie meal in SA in R115.00 today. When I arrived in South Africa 1990, the Rand was R2.00 to a Dollar. Its now R16.00. Today one mining company in Zambia has just announced and investment worth millions in our mines at a time when HH’s Anglo American is closing down mines world wide and consigning miners and their families to untold miserly. 25kg of mealies in South Africa is K115.00. Ala aba bantu nibambula maatwi! Bebeni!! PF has never banked on North Western to win elections, lungu has gone there becoz he is a president for all Zambians. Besides it is his responsibility as a republican HH cant be allowed untill campaign period. 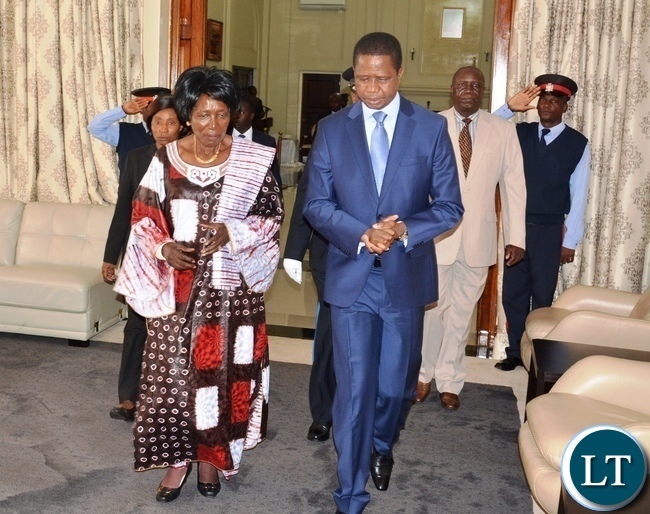 lungu will not put on PF material untill campaign period. You can campaign all you want but come August 2016, no vote for you PF. Your 5 years have been a big dire misery for many Zambians due to populist and visionless politics. It was a giant mistake to put you in power in 2011 and urgent exit is what we await for now. ULI NDOSHI …..I HOPE SKEPTICS ARE NOW CONVINCED THAT THEY WILL BE NO RE-RUN! @Ask Munkombwe, Nkunika is using Bemba when talking to locals there while your Bemba friends insist on using Bemba in SP. In any case, do we have any Tonga appointed as PS in other provinces? Be real. @Luapula Premier-Lucky Mulusa is not normal,one would expect him to categorically name those projects,anyway,as I said,I know what I’m talking about.I’m not a dreamer like PF cronies who are anathema to whatever is really!Two months for your misrule,payback time is nearer!